Among the most iconic, successful, and recognizable Hawaii products worldwide are those from Hawaii’s fashion industry -- aloha shirts, surf shorts, muumuu. Hawaii designers are nationally and internationally recognized and have been featured in New York’s Fashion Week. What is a typical fashion design process – from concept to the finished product? How do art and business blend together? What does it take for a designer to establish and sustain a presence? How does Hawaii’s fashion industry compare with New York’s? Is it possible to manufacture in Hawaii? What are the opportunities and challenges for the future? Sig Zane of Sig Zane Designs, and his wife, Nalani Kanakaole, opened the doors to Sig Zane Designs in 1985 in Hilo. Their mission was to educate and share what they knew about their culture. Their son Kūhaʻo carries the torch further into the next generation. Sig’s designs for men’s and women’s clothing honor nature and Hawaiian values. Living in the rhythms of tide and wave, sun and moon, nature has defined Sig from the beginning. Surfer, fisherman, hula dancer, artist, cultural exponent - reflections of his life are found in each design. Tara Boone of Tara Boone Design House was born and raised in Hawaii. Following college and design school, she started her own fashion design company in New York City selling to stores like Bloomingdales, Henri Bendel, and over 600 high end specialty stores. She has traveled around the world. In 2017, she opened Tara Boone Design House, a women’s clothing and accessory boutique in Kahala Mall. She has helped young designers and small businesses with Fashion Business and Marketing including design direction, branding, web design, logo design and business logistics. 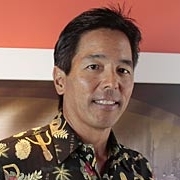 Lloyd Kawakami is president of ‘IOLANI, Inc. (‘Iolani Sportswear), one of Hawai’i’s oldest apparel companies founded by his parents, Keiji and Edith Kawakami. As a manufacturer, wholesaler, and now retailer, ‘IOLANI carries on a family tradition of quality and innovation as it celebrates its 65th anniversary. Moderator: Melissa White is an urban planner and community builder with SSFM International. Alongside her planning work, she co-founded and led the Hawaii Fashion Incubator (HIFI), a community-based organization dedicated to promoting Hawaii fashion as art and industry. During its eleven years of existence HIFI assisted hundreds of local designers, photographers, and other fashion professionals in showcasing their work and growing their businesses.